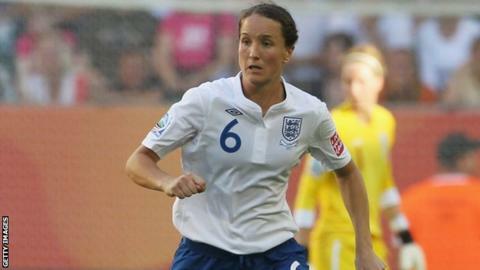 England captain Casey Stoney was sent off as Lincoln were held to a 3-3 draw by managerless Liverpool in the Women's Super League's final match before its Olympics-enforced mid-season break. Stoney was dismissed two minutes into stoppage time for a second bookable offence. Yellow-carded for dissent 14 minutes from time, Stoney saw red following a foul on Kelly Jones in the penalty box. And Jones picked herself up to score the late equaliser from the spot. It was a devastating end to the contest for the Imps, who had controlled much of the play but were twice pegged back after putting themselves in a commanding position. Two Precious Hamilton goals gave them an early advantage that was cancelled out by strikes from Emily Gielnik and Chloe Jones. Remi Allen restored the home side's lead with a late penalty, but then came the stoppage time drama and Kelly Jones's last-gasp point-saver. Central defender Stoney, who is likely to skipper Team GB at the Olympics, ended the game off the pitch after starting in some style, brilliantly setting up striker Hamilton to fire in the third-minute opener. Hamilton forced in her second goal 12 minutes later after a shot by her strike partner Carla Cantrell had been blocked. Liverpool fought back for Gielnik to reduce the arrears, turning a 24th-minute Michelle Evans free-kick into the net. But the Imps were soon back on the offensive and Hamilton twice went close to completing her hat-trick before half-time. The home side continued to have the edge after the break, but the battling Reds stood firm and equalised when midfielder Chloe Jones's 71st-minute shot was deflected off defender Sophie Bradley to loop over goalkeeper Nicola Hobbs. It took Lincoln just two minutes to regain the lead, however, midfielder Allen scoring from the spot following a foul on Hamilton by defender Vicky Jones. The Imps pressed for a fourth goal to seal victory, but instead the final strike arrived at the other end as midfielder Kelly Jones struck home the equaliser seconds after Stoney's dismissal. Victory would have taken Lincoln to joint-second place in the table but instead they remained sixth, two points behind a clutch of four clubs level on 11 points. That foursome sit eight points behind leaders Arsenal, who at the half-way stage of the campaign are odds-on to retain the title they won last year. Liverpool, with caretaker boss Andy Williams in charge following the dismissal of Robbie Johnson, are seventh in the eight-team table and Doncaster Belles are bottom.